Huge Savings Item! Save 13% on the 3dRose Andrea Haase Animals Illustration - Zebra Mother With Child Watercolor Illustration - Flip Straw 21oz Water Bottle (wb_268155_2) by 3dRose at Animal Backgrounds. MPN: wb_268155_2. Hurry! Limited time offer. Offer valid only while supplies last. Zebra Mother With Child Watercolor Illustration Water Bottle is an eco-friendly way to carry your favorite drink to school, work or anywhere you go. 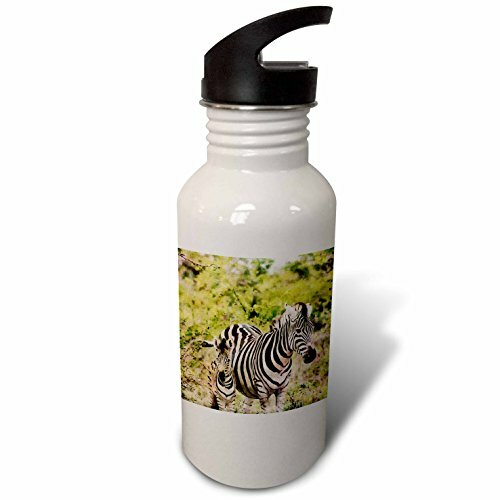 Zebra Mother With Child Watercolor Illustration Water Bottle is an eco-friendly way to carry your favorite drink to school, work or anywhere you go. This 21oz stainless steel water bottle features a flip up spout with removable straw. High gloss image printed directly to white glossy exterior surface. Image on both sides. Color will not run or fade with use. Hand washing recommended.